This article explains what could cause an Invalid Device ID error and provides guidance on how it might be resolved. 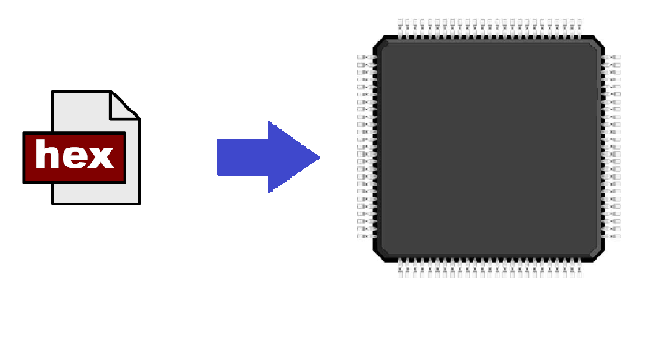 To get a program running on a PIC® microcontroller, you have to compile the code into a hex file and then download (program) this hex file into the PIC. To program the hex file into the PIC, the device must first be put into a special operating mode called Program Mode. Once in Program Mode, the data from the hex file can be sent to the device through programming pins on the PIC. A programming tool (known as a programmer/debugger), such as PICKit™3 or MPLAB® ICD 3/PM3/REAL ICE™, can be used to put the PIC into program mode and program the hex file data into the device. There are different programming algorithms used, depending on the PIC microcontroller, so the programmer must find out which device it is connected to and then use the appropriate algorithm. To do this, it enters program mode and attempts to read a register in the PIC which contains a device specific identification number (the Device ID). Note: the MPLAB X IDE or IPE software handles this operation when you issue a program command. When everything is working OK, the programmer will read the Device ID from the PIC microcontroller and identify the device (Figure 1a). When something goes wrong the programmer will not be able to read the Device ID and an error will be given (Figure 1b). Clocking a 32-bit key into the program data pin (PGD). Which method is used depends on the specific device being programmed. Once in program mode, the device’s program memory can be accessed and programmed using the program data (PGD) and program clock (PGC) pins. 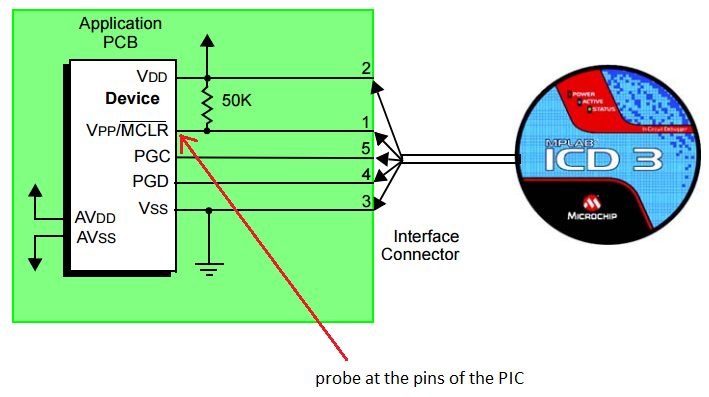 To place the device into program mode using this method, the programmer holds the PGC and PGD pins low and raises the MCLR/VPP pin from 0 V to VIHH (high voltage level). The timing requirements for these transitions are shown below. Refer to the device programming specification document for the meaning of the parameters P1 etc. Briefly drive MCLR high, then drive it low. Clock the 32-bit key sequence onto the PGD pin. Drive MCLR high within a specified period of time and hold it in this state. Program mode operations require the use of the programming voltage pin (MCLR/VPP), the programming data pin (usually labeled as PGD, PGED or ICSPDAT), and the programming clock pin (usually labeled as PGC, PGEC or ICSPCLK). In addition, this mode requires that the power pins be appropriately connected, i.e. all VDD and VSS pins must be connected, as well as the AVDD and AVSS pins. If the device has VCAP, ENVREG, or VBAT pins, these must be connected too. The Programming Specification document for each device, available on the device web page, will detail this information. The MCLR/VPP pin can be checked first. 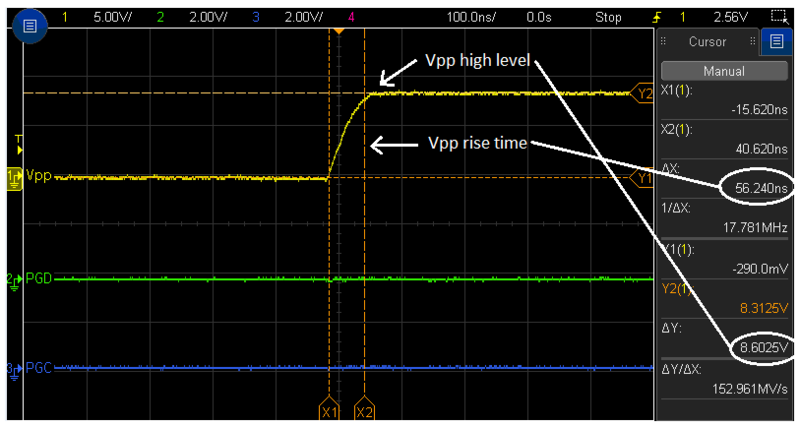 Figures 5 shows the high-voltage level and rise time specification for the voltage on the MCLR/VPP pin as listed in the programming specification document and an oscilloscope measurement of these parameters on the MCLR/VPP pin (Figure 6). NOTE: The values shown in Figure 5 are taken from the programming specification for one particular device. It may be different depending on the device used. Always refer to the programming specification for the specific device being used. 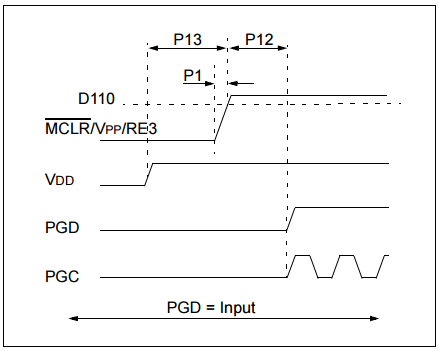 For the PGD and PGC pins, a visual check on the oscilloscope will confirm if both the pins are active, the voltage levels are close to the VDD voltage level and if the square waves are not too rounded. Refer to Figure 7 for an example of what would be seen on a functioning setup. If needed, a closer examination of the voltage level and timings can be checked against the parameters in the programming specification. Step 2: If the signals on the programming pins show a problem, then the signals should be checked along the path from the PIC microcontroller to the programmer. For example, if there is no signal present on a pin, or if the signal present has an incorrect voltage level, this could indicate an issue. The objective is to find if the source of the problem is coming directly from the programmer or if it is happening at some point between the programmer and the PIC microcontroller. Step 3: To isolate the programmer from the target board hardware, the user can disconnect the programming signals VPP, PGD and PGC from the target board, if possible, and leave power connected. The programmer will not attempt to enter program mode without power being connected, so it must be present. Once the programming pins are disconnected from the board they can be checked with an oscilloscope. 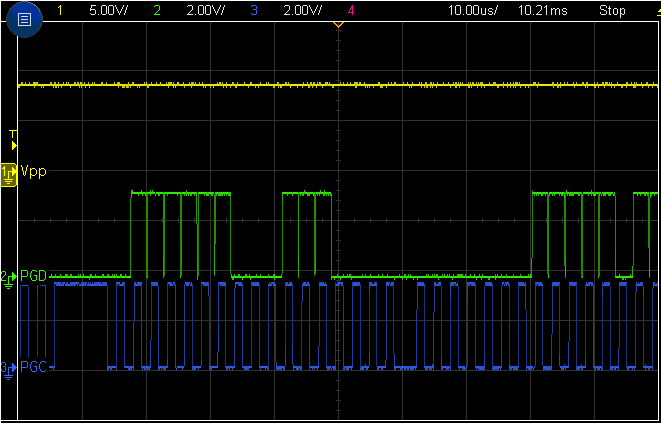 This will show what the signals look like without being affected by the target board hardware. Bad connection between the programmer and the programming pins on the PIC microcontroller. This could be the result of connecting the wrong pins, or an unstable mechanical connection. External components on the programming pins. Any components added to the programming pins could be interfering with the programming signals. Not all pins connected. As well as the programming pins, there are other pins which are necessary for proper operation during program mode. Refer to section "Pin Connections Needed for Program Mode" above.